As if journalists and journalism students didn't have enough to worry about. Now there's so-called Native Advertising. So-called because it can appear to be "native" to the regular journalistic content found in print and online. It is advertising that can appear quite seamless and even integrated into the rest of the news. In some media organizations, journalists are being pressed into writing and creating the ads, thus pulling down the long established separation of editorial from business. When it's well done, it can appear to be deceptively journalistic. And that's the problem, and the challenge. As the traditional advertising market, especially in print, collapses, Native Advertising has emerged as a possible saviour for a media that has been struggling to find its financial footing. In the US, this new form seems to be working, earning around $4.5 billion for print outlets last year. Often the ads are better looking and have more real information than the news organizations in which they are planted. Now journalism has to compete with ads for the fragmented attention spans of the audiences. 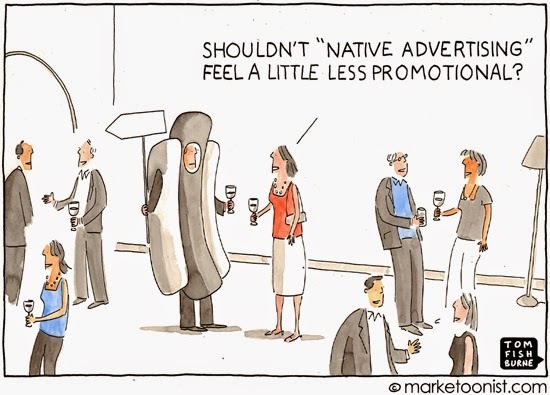 Radio - commercial and public - have been immune to Native Ads. So far. That's because in commercial radio, ads have saturated the market leaving no place left to shill. Public Broadcasting in the US isn't employing native advertising. But it does something similar and calls it "underwriting." On the radio, they can be found just before the newscasts. On public TV, they are more widespread and last for longer. Euphemistically, they are called "enhanced underwriting." CBC TV has run ads for years, making it look very much like commercial television. And rumour has it that CBC TV will soon try the underwriting route to support its rapidly disappearing advertising revenues. Public radio in Canada is trying- not very successfully - to insert ads just after the hourly newscasts on CBC Radio 2. This is a recent phenomenon and they are not successful because they sound raucous. These ads are directly bought from commercial agencies. As a result, they also sound completely out of place on the more demure if occasionally stridently hip airwaves of CBC Radio. Now the hottest media ticket in town - the podcast has arrived. Podcasts are proving to be sizzling and exciting, especially in the public radio community. Podcasting is also proving to be a ratings bonanza. Of the top ten podcasts in the US, seven are from NPR and individual public radio stations. NPR podcasts are being downloaded more than 25 million times a month. Advertisers, of course, have not been slow to notice this trend. And they are eager to tap into this younger, more hip and increasingly affluent demographic. A group of freelance radio people based in Boston, called AIR - Association of Independents in Radio, asked me to assess this phenomenon and whether it should be embraced or shunned. My conclusion: It's too late for shunning. But it is not all bad news. If podcasters treat the listeners with respect, then it may be possible that Native Ads may not only be necessary, but a timely life raft for a floundering media still looking for its payday. Nooooooo! Dvorkin has gone over to the dark side. MB - Some see only gloom. I can see a ray of light.